Historic New England Collections Manager Nicole Chalfant is spreading the word about collections care and storage. 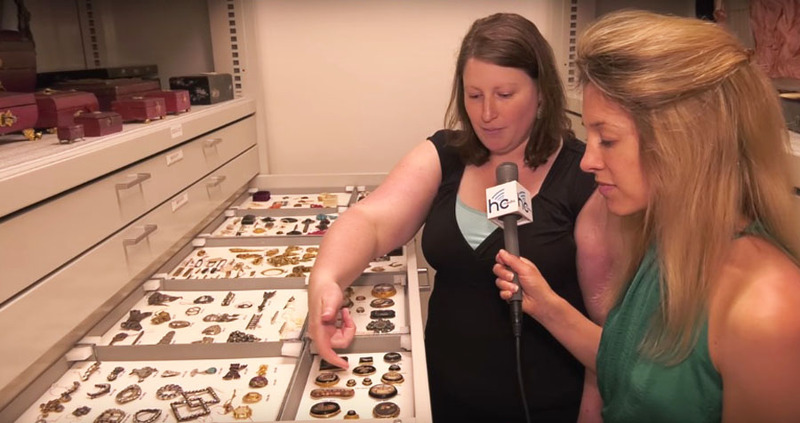 In June, Nicole led Haverhill Journal host Lindsay Paris on a tour of new climate-controlled storage space for decorative arts at Historic New England’s Haverhill Facility. Nicole showed Lindsay our new “room within a room” storage, completed as part of a multi-year Collections Care Project. She explained how Historic New England uses objects to tell stories of family life in the region. On July 26, Nicole shares her expertise on caring for historic house museum collections during a full-day workshop with the Connecticut League of History Organizations and Connecticut Humanities Council. She will talk to museum colleagues about how Historic New England handles collections issues including pests, object movement, and the cleaning and maintenance of museum objects and spaces at our historic sites. Watch the Haverhill Journal segment. Read past updates from the Collections Care Project.